Why can it be difficult to decide whether or not a person is an informal carer and does it matter? 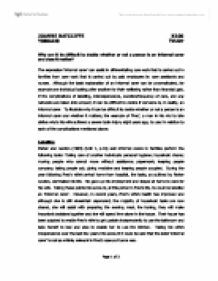 The expression 'informal carer' can assist in differentiating care work that is carried out in families from care work that is carried out by paid employees ie: care assistants and nurses. Although the basic explanation of an informal carer can be uncomplicated, for example one individual looking after another for their wellbeing rather than financial gain, if the complications of labelling, interdependence, duration/frequency of care, and any networks are taken into account, it can be difficult to decide if someone is, in reality, an informal carer. To illustrate why it can be difficult to decide whether or not a person is an informal carer and whether it matters, the example of 'Fred', a man in his mid to late sixties who's his wife suffered a severe brain injury eight years ago, is used in relation to each of the complications mentioned above. ...read more. Their house has been adapted to enable Fred's wife to get upstairs independently to use the bathroom and take herself to bed and also to enable her to use the kitchen. Taking his wife's independence over the last few years into account it could be said that the label 'informal carer' is not as entirely relevant in Fred's case as it once was. Interdependence In Fred and his wife's situation it is plain to see that Fred is the carer. Looking at the caring aspect of the relationship Fred's wife relies on him for transportation, helping with the grocery shopping, and household chores that she is physically unable to manage. Fred and his wife rely on each other for companionship, love, advice and support and as a result their relationship is interdependent. Duration and Frequency of Care The categorisation of a carer has been refined to mean a person who is both the main carer and also spends 20 hours a week or more on caring. ...read more. As soon as Fred's wife was discharged from hospital, advice and assistance was received from the local services. In this instance being recognised as an 'informal carer' has helped Fred and his wife in recovering after such a traumatic event. 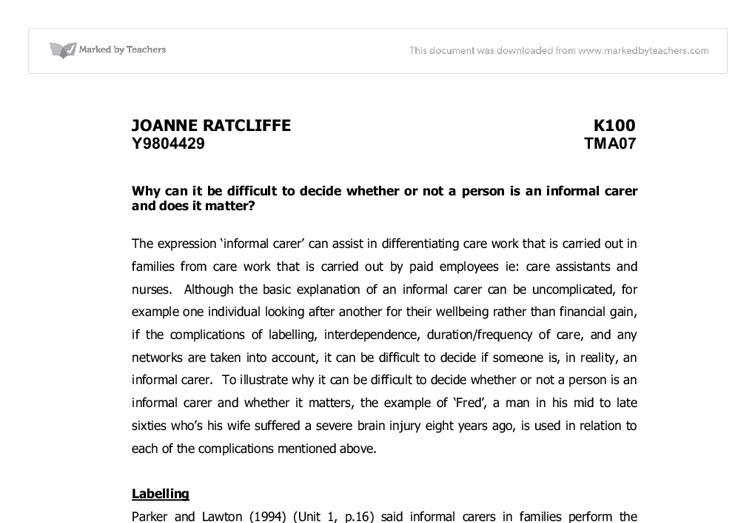 In conclusion, it could be fair to say that it can definitely be difficult to decide whether a person is an informal carer. Although there are some complications in Fred and his wife's situation, he is recognised as an 'informal carer' and this has had a very positive impact on their lives. Fred cares for his wife on a daily basis and is with her almost 24 hours a day, although she is independent and has responsibility for tasks in the home. They are in touch with local services who have provided support and advice on practical and financial matters. They depend on each other to maintain their married relationship as well as that of carer and cared for. These are just some of the factors that demonstrate the common problem of defining informal care. ...read more. From observing the above situation I have an understanding that all patients should be treated equally no matter what condition they have or what state that they are in and they should have an equal access to treatment. The last part I have analysed how this will effect my own practice, which fits in with the Newham's model of reflection. * Place contrasting colored rugs in front of doors or steps to help the individual anticipate staircases and room entrances. Avoid injury during daily activities * Monitor the temperature of water faucets and food because the person may have a decreased sensitivity to temperature. It is important for Valerie to identify when she might require more help or eventually no longer be able to care for her son. Networks In some cases where there is a large family network this could count against an individual to be recognised as a carer, so it is important to identify exactly what roles people play. Other family members would help with this as well as my sister, uncles, and grandmother, and to a point my young children who would help by reading to him or by playing games such as "I spy". carer shortly before Edith moved to the nursing home however when the care began it is less easy to say. I will now discuss the four complications and how they relate to my case study. The first of these complications are interdependence. This is not something our family have as me and my partner care for Harry and interdependence means there would have to be more caring responsibilities by other family members. There's a good example of this is the case of Katrina. To indicate if Barbara is an Informal Carer, we need to consider four complicated factors: Interdependence - Looking closely at the family is important to recognise who is dependent on whom, or are they interdependent on each other? In Marjorie's situation she is dependent on her daughter and Barbara does need her mother for company. The study by Potter et al (2004) has examined factors inhibiting learning in the health care settings. As per this study, presence of symptom and absence of knowledge, medical awareness, high pressure and work load as well as waiting are the prime barriers to efficient and effective patient discharge education for spinal cord injured patients (Potter et al., 2004).